Eternal Anchor was founded in December of 2014 by a group of Christians who are passionate about serving the special needs community in Baja California. Eternal Anchor was not the vision of one person, but God’s vision that He put on the hearts of many who have been to Mexico, seen the need, and have felt called to serve God by serving children with special needs. 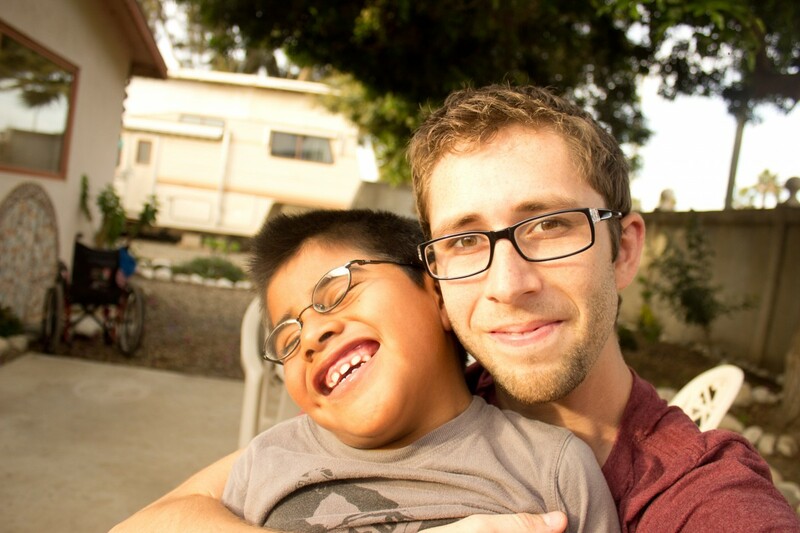 Three and a half years ago, God led me to Mexico to serve as a teacher for children with special needs. I served at a school called the Disabled Children’s Learning Center at Foundation for His Ministry in Vicente Guerrero. It is a beautiful program that fosters an environment of love and safety where children can learn and reach their God-given potential. Time flew by and my one-year commitment turned into three and a half years. During that time, there was one child in particular who changed my life: Jesús. The 7-year-old mentally delayed and epileptic boy came to the school in November of 2013. When he first arrived, he looked like a zombie. He had spent his life in his wheelchair and had experienced little to no social interaction or stimulation. His dad brought him to the program because the family had recently been abandoned by Jesús’ mother and he was desperate for someone to watch his son so he could work and provide for his family. After he was accepted in the program, I had the opportunity to work with Jesús. I watched how the staff and kids gave him the love and social interaction that he needed. I saw him transform into an affectionate, playful little boy. Yet, in spite of his social progress, Jesús still struggled with his health. Because Jesús’ dad has a learning disability himself, he couldn’t keep up with his son’s daily medication schedule. And, without his medication, Jesús suffered from multiple seizures a month and numerous hospital visits. I remember thinking about what it would be like to be a single father of a child like Jesús. Without the support of family or a church community, I couldn’t imagine the hopelessness and exhaustion his dad must have been feeling. At the time, I did my best to reach out to him with the other staff of the Learning Center. At one point, Jesús’ dad asked me to help him find a home for his son where Jesús could be safe and healthy, and where his dad could visit him often. I called all of the orphanages in the state that accept children with special needs, but there were no options for them. Then, I called the government and was told that there would be no intervention. I was told that it is better that the child die with his family then be taken and placed in a home away from them. The reality is, even if the government wanted to help, there was nowhere to place Jesús. At that time, God spoke to me through the parable of the Good Samaritan. After a Jewish man had been beaten and robbed, he was passed by two of his religious countrymen without receiving help. A foreign man walked by who had no earthly responsibility to help. Without hesitating, though, the Good Samaritan decided to pick up the broken man, take him to the hospital and pay for all of his needs. He saved his life. Whose responsibility was it to help Jesús? I often wrestled with that question. Many people close to me told me that extending help to this family was too much for me to handle. I was told to let the government deal with it. But that was not the message I was hearing from Jesus’ parable. I felt overwhelmed by the immense need of this one child and kept thinking that there are millions more who are just as needy. Would focusing my time on helping this one child take away from the opportunity to help others? That’s when things became clear. God hadn’t put a million children in my path. He had just put the one. Is it right to sidestep a person in your path that is in need with the expectation that you will be able to reach more with your time and resources in the future? If the Samaritan hadn’t taken the time to help the man in his path, what would have happened? Would the man’s government have helped him? I don’t think so. I think the man would have died. And I think that Jesús would have died without help. After a lot of prayer, I made the decision to help Jesús by offering him a home with me. At that time, I didn’t know what my offer would look like. I didn’t know who else God would bring to help me (if anyone). But I knew it was right. I went to Jesús’ house and spoke to his dad, offering to help take care of his son. Jesús’ dad told me that the night before, he prayed to God that he would send me to help him. We both saw this as an answer to prayer. When I made this decision, I quickly realized that this was bigger than me helping one child. My friend and co-worker, Deborah, talked to me and told me that God was also speaking to her through the parable of the Good Samaritan and that she felt it was time to faithfully meet a need in our community, as well. I called my brother, Alex, who lives in the U.S. but has been passionate about serving children with special needs in Mexico for the past ten years. He told me that God had been stirring in his heart the desire to respond now, too. And one by one, I began to call and write to people that God had connected me to in the last 3 and a half years who have shown a love and desire to serve children with special needs in Mexico. Within two months, we formed a board of directors and shortly after, we launched Eternal Anchor.